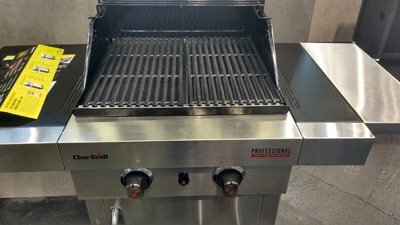 Here you'll find some basic cooking tips for gas grills so that you can get the most out of your gas grill cooking including how to light a gas grill. It might seem obvious to anyone who has a gas cooker in their kitchen at home how to light a gas grill but at the risk of stating the obvious I think it worthwhile running through the process so that you don't get caught out or indeed injure yourself. Every time you flip a piece of meat you cool the side that was starting to cook. Resist the temptation to flip and turn just the once. Resist also the urge to squeeze your spatula and press down on food such as burgers and steaks. All this serves to do is drive out the moisture and make the end result dry. Don't prick food. This is just another way to dry it out. Meat should cook in its fat, that's what adds the flavour. On this same point, beware of serrated tongs as these have the same impact as pricking the food. Season steaks only on one side. When searing a steak you want a really hot grill and the seasoning acts as a heat barrier so by only seasoning on one side you are allowing as much heat as possible to get to the steak without compromising on flavor. Use a marinade, this will add flavour and succulence to your cooking. A little sugar in the marinade also tenderises meat. Provided you have a gas grill with a lid then you can also cook indirectly. This basically means that the food is not directly over the heat source and so by closing the lid you are creating an oven. 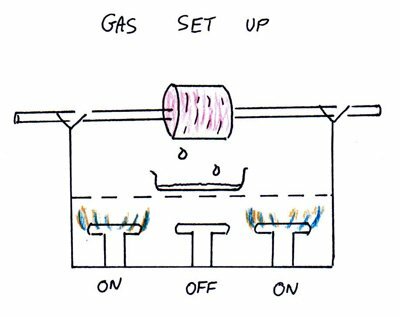 My drawing below shows how you would set up a gas grill for indirect cooking when using a rotisserie. This assumes that you have a three burner grill where you light the peripheral burners and keep the central burner turned off.